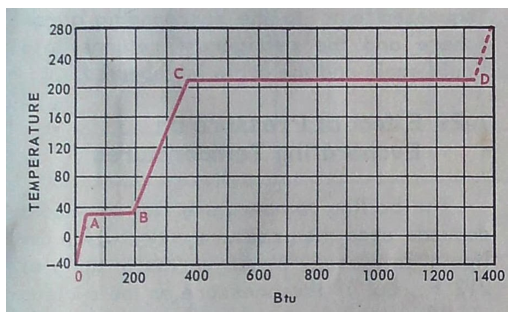 More heat is added from B to C increasing the temperature of the water but not changing the phase – water remains a liquid. This is sensible heat as you can feel it. Heat is added from C to D to change the water to steam but temperature does not change. The amount of heat required to do this is 970 BTU / Lb. this is latent heat. 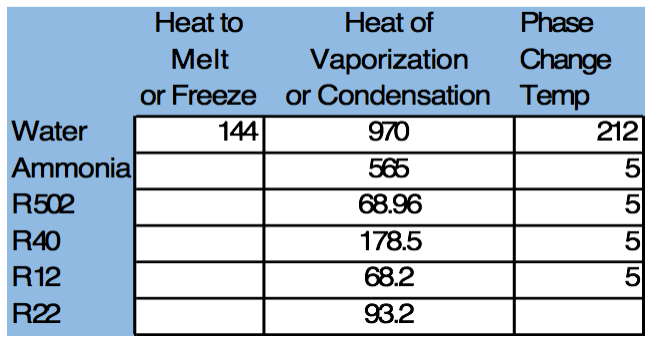 Once point D is passed water vapor ( steam ) gets hotter and hotter. This is sensible heat. Since 1 Tn of refrigeration is defined as the removal of 12,000 BTU / Hr we can see that a cooling tower must evaporate	12,000 BTU / 970 BTU / Lb. = 12.37 Lbs. of water = 12.37/8.34 gallons / Lb. = 1.48 or about 1.5 gallons of water per hr. to deliver 1 tn. of cooling.